It's been requested for a long time that iNacho provide a way for users to find nachos in other areas that they are not currently living in or visiting so they know what to look for when they do visit those other places. Well, while this feature is not currently integrated into the app itself, iNacho's website now has a "Maps View" which shows all of the locations in the world currently reviewed with iNacho. I've authored a few bitcoin articles on CoinChomp over the last month while only alluding to iNacho. By its name, you wouldn't know it is heavily tied into bitcoin and in truth, it wasn't at all such until about two months ago when I started the contest. In fact, two months ago, I myself wasn't very involved in the bitcoin community. My fiance and I had gone through the process of understanding bitcoin mining and purchased some minor asic boxes. He kept saying we needed to mine bitcoin to receive some ROI (Return On Investment) but I somehow convinced him that we needed to use our first bitcoin to promote iNacho. So that's what we did: On March 31, I announced the Great iNacho Bitcoin Contest. The rules were simple: review nachos and all reviewers would be entered into a pool in which a drawing would be made at the end of three months. Sure, there were some other requirements (like the reviews had to include a picture of the nacho even though the app itself doesn't require that) but the main stipulation was that in three months, I had to receive 100 new nacho reviews. The prize: 1 bitcoin. Back then, bitcoin pricing was on the downtrend but here we are into June now and it's over the $600 threshold and steadily climbing. 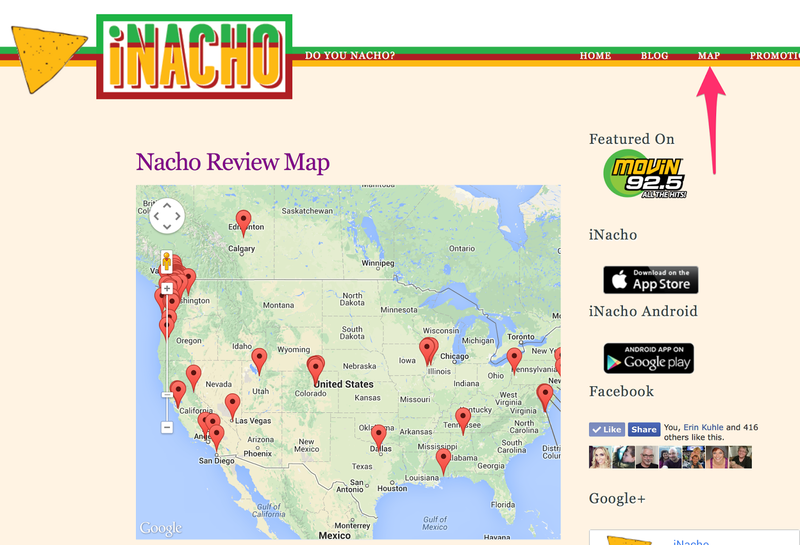 For those of you who are not familiar with iNacho, it's a fun mobile app released for both iOS and Android platforms that helps users find, review, and share nacho reviews nearby. The database is fully crowdsourced and lightly moderated but essentially, if you happen upon a great plate of nachos, you can review it, submit it with a picture, what toppings were on it, and other users can use your rating of the venue for the betterment of their dining out experiences. In the same way, if other users have submitted reviews at their favorite (or not so favorite) places, you can find the ones closest to you and if you like the review and want to try out that venue in particular, iNacho makes it easy to find the venue by providing you with map and driving directions via the applicable apps on your phone. Interestingly enough, after I announced and began promoting the contest, I started to interact with a plethora of bitcoin users and enthusiasts. I had one person offer to try out iNacho and write about it and another person interview me on Live Youtube about it. In the middle of all of this, I was also invited to a Google Plus Bitcoin group for Women and I found lots of support there. My eyes were opened to this wonderful and gigantic community in support of this new technology. Then Yelp announced they would start adding an indicator denoting which venues in their database accepted bitcoin and I thought to myself, "Hey! I can do that with iNacho too." And within a couple days I had implemented and released it on both iOS and Android. Now users can not only submit nacho reviews but with their review, they can submit locations that take bitcoin as well, allowing you to search for venues nearby that take bitcoin as well. While this feature hasn't been overly utilized as of yet, I have faith it will be, especially as more venues start accepting bitcoin. In that time, I started blogging about bitcoin and getting involved with some youtube bitcoin shows as well and attending bitcoin meetup events. And out of the 100 reviews needed for the contest, we are at a whopping 50 already! That's right, we only need 50 more reviews by the end of June and I can give away the bitcoin burning a hole in my pocket.